I was lemming this for a while so when I saw it at a salon I decided to get it. This has a little bit of shimmer to it which make sit interesting. I love the color it's so cheery! I was bored and added some brown and white dots. I don't like it lol. Looks like a good combination. I really like this one, it's one of my favorites but no matter what I do, I always get major air bubbles when applying this which is a bummer. I have this one but never used it!I love it on you and I like that it is not a stark pastel yellow, it's softer and beautiful! 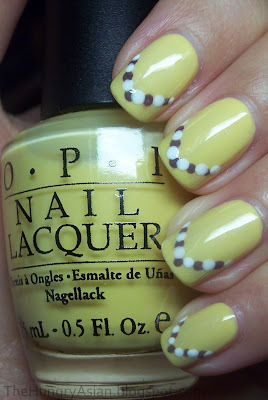 With the dots, your nails look like cute little flip-flops! I am so jealous that you can wear these sweet pale yellows or any yellow for that matter. I LOVE this color! It's so cute. Perfect on you, I'm glad you picked it up! I lol'ed when I read Rebecca's comment about the flip flops, I totally could see that! Oh I saw this colour once but it didn't look good against my skin. I totally agree with the previous comments. They really look like cute little flip flops! It was the first thing that came to mind when I see them. Hehe. Oh I always wanted this color too, it's so pretty on you. I love the little dots, such cute flip flops! i love your nails short! Beautiful, I love the dots! I LOVE your nails at this length BTW. Adorable! Little flip flop feet. Love the color on you. Very pretty shade.